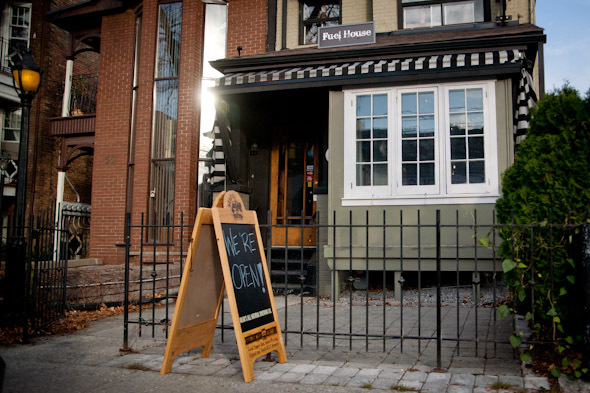 Fuel House might live in the shadows of College Street giants but it should not be overlooked. Occupying the space that used to be Olivia's at 53 , Fuel House blends into residential Clinton Street. According to owner Mackenzie, it might blend in a little too much as it tends to get passed by, so they're trying to get the word out. As we walked into the foyer at 53 Clinton, and were greeted by Mackenzie as he came down the hallway, it really did feel like we were arriving for dinner at somebody's house. At first, because it was a quiet Monday it was a bit off-putting, almost like we were crashing a family meal, but it didn't take long to get comfortable. 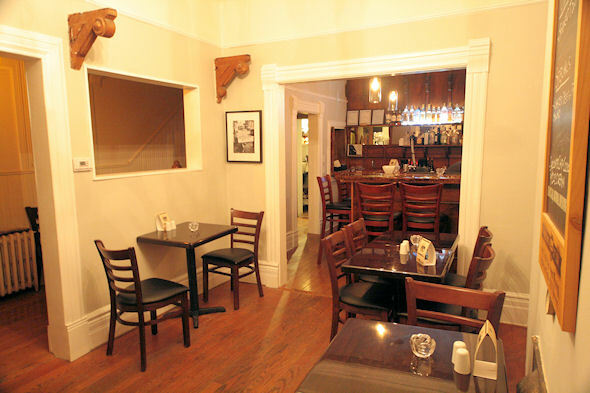 The main dining area is small, with a light fixture in one of the walls that gives off almost a fireplace glow. Windows, with stained glass overhead, open up to a solarium where there is a bigger table for bigger groups. At the opposite end through an archway is the bar where diners can pull up a stool and have a pint of either Beau's Lug Tread or Sapporo. 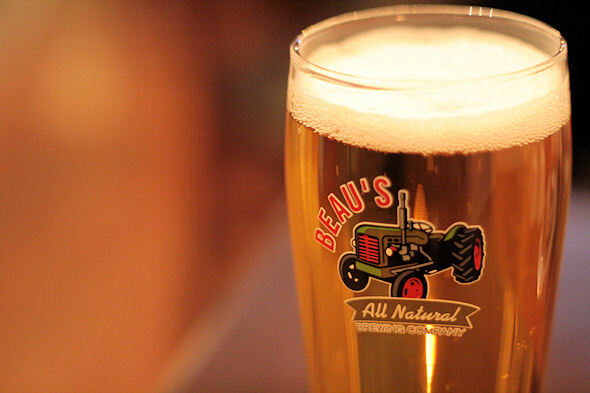 The beer choice mimics the food, in that it is grown-up pub fare with some Asian influence thrown in here and there. 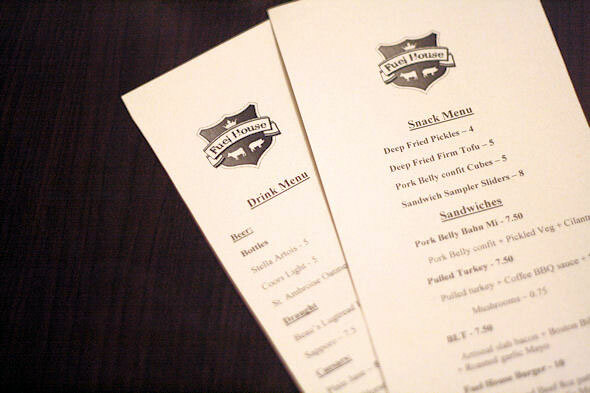 Open for just over 3 weeks now, the menu is on the small side and sandwich-focused, but it has a thoughtful selection, and Mackenzie informed me that they are thinking about expanding the dinner items. Lucky for me, anytime is sandwich time. The Pork Belly Bahn-Mi was tempting, but with the holidays approaching my thoughts have already turned to the bird of the season, so I was looking forward to the pulled turkey. 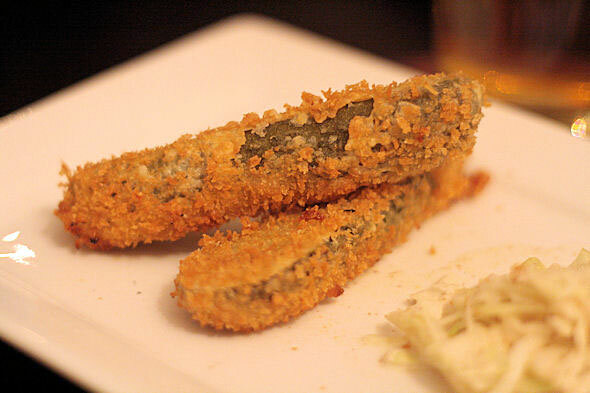 There was a slight detour on the way to said sandwich though, and it came in the form of deep-fried pickles ($4). Four spears came breaded, fried and served with coleslaw. The pickles were nice and crisp, and my only complaint was that the breading tended to come away from the pickle. We both really enjoyed the slaw however. It was Dijon based as opposed to mayo. Audrey went with the specials of the day that included Smoked Tomato Soup ($5) and a Roasted Beet & Poached Pear Salad ($6.50), both of which I tried of course...it's research after all. 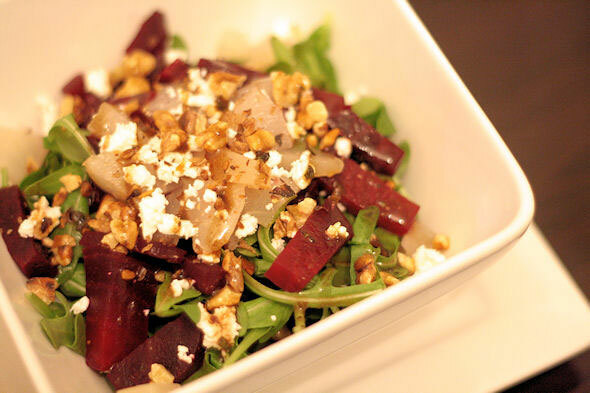 The salad was served on arugula, with goat cheese, walnuts and a honey-balsamic dressing. I'm not normally a fan of fruit in my salad, but that all changes when it's paired with goat cheese and walnuts. The sweetness of the pear and honey was offset nicely by the cheese and balsamic, and the different textures married well. Unfortunately, seeing as she was the one who ordered it, Audrey got the lion's share. Fair enough. The soup was perfect for a cold winter night (maybe we'll have some of those soon, however I'm not complaining) and tasted homemade. 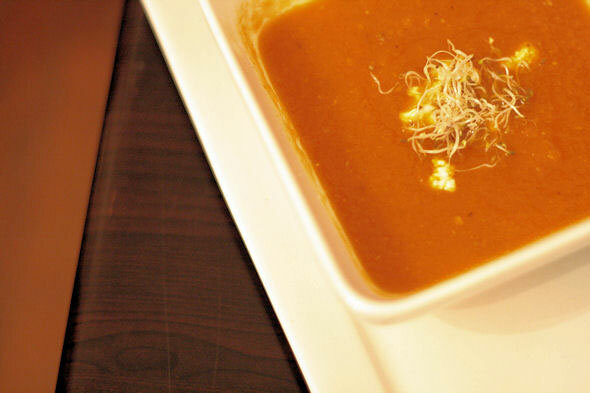 It was the perfect consistency and wasn't too sweet as some tomato soups can be. The highlight of the night for me came in sandwich form ($7.50). The pulled turkey drenched in coffee BBQ sauce (loaded with the aforementioned Dijon slaw) and served on a very soft bun melted in my mouth. This was my first time having pulled turkey, and to be honest, with all the sauce and fixings it didn't taste unlike pulled pork...but that isn't a bad thing. Everything about this sandwich was right, including how messy it was to eat, and how full it made me. Mackenzie and Mike are quiet but welcoming hosts and I foresee a lot of regulars in their future. This is the place to go if you feel like being in the comfort of your own home (without being in your home), and eating homemade food (that you didn't have to make). Their slogan promises fuel for the heart and soul, but I would definitely add stomach to that list.